When shopping at our Outlet it can be easy to get overwhelmed by the volume of cabinets, vanities and tops that we have. Some people don’t even know where to start and others have a clear vision of what that want to create. Some find the experience inspiring and walk out with items to create a DIY project that they hadn’t even thought of before they stepped through our doors! 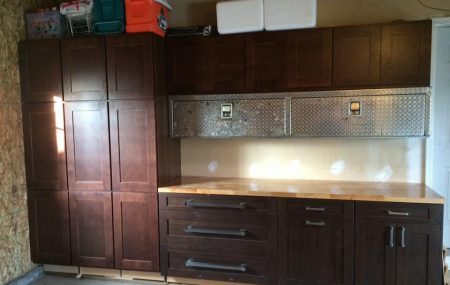 This garage project was created using a combination of our miscellaneous cabinet selection and a display from our Lansing showroom. The three pantry cabinets on the left and the upper cabinets are Smart Montana Rootbeer and lower cabinets on the right are from an Executive Cabinetry display that we no longer carry. Included with the Executive cabinets was the heavy duty masculine hardware, which is the perfect fit for this garage storage project. The project was completed with two aluminum truck tool boxes attached below the upper cabinets and a butcher block countertop. This DIY project would make a great addition to any handy man’s garage. The cabinets are sleek and modern giving the garage a more luxury look at a low price point. The cabinets also provide much needed storage for tools, seasonal items and other miscellaneous objects, plus an added work space for projects! © 2016 Williams Kitchen & Bath. All Rights Reserved.